The Olympus could quite possibly be the pool you can have when you thought you didn’t have the space for a pool! 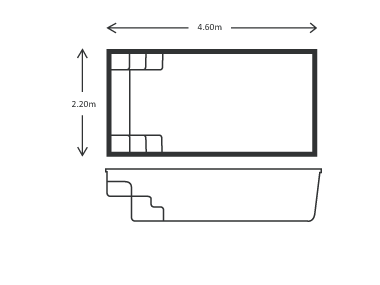 As part of our popular plunge pool range, the Olympus at a compact 4.60m in length and 2.20m in width may be the perfect fit for you. A plunge pool will still allow you to cool off on a hot day in the privacy of your own backyard. At the same time, the Olympus can be turned into an exercise centre with the addition of a Swim Jet System. The 4.60m length can seem a very long way when you’re swimming against a powerful Swim Jet System!